Every man’s pain threshold is different. As is his tolerance of ridicule, or as the quote above aptly reminds us the fear of ridicule. That threshold may come as low on the scale as pink shirts, alternatively it might be bowties, spectators or a lime green cotton jacket. I suspect that you like me have at some point demurred from purchasing some item of apparel on account of what others might say; and no doubt with seemingly good cause. After all, it was the daddy of all us clothes horses, Beau Brummell, who said “if John Bull turns around to look at you, you are not well dressed”. Of course there are two problems with this philosophy. Firstly, rigid adherence to this rule would have deprived us of all the great dressers, most from the late Duke of Windsor to Agnelli and Carry Grant were innovators. The second problem is that living your life according to what others may think strikes me as a particularly timid existence. That’s not to say I don’t suffer from a failing of nerve from time to time in matters of dress. But my method of overcoming it is really quite simple, I think about it. Obvious I know. But, I don’t mean a quick 10 minute ponder while I’m waiting in the queue to pay for said item. I mean I’ll spend anything from 1 to 6 months considering the item. I’ll imagine myself wearing it in every conceivable connotation and any and all settings. I did this before buying my most recent purchase. I’m a smoker and like Terry Thomas before me I can’t abide nutmeg fingers or the smell of cigarettes on my hands. The obvious solution, other than quitting smoking, is a cigarette holder. But this bit of kit is somewhat old fashioned and can look both effete and just plain pretentious. As such you can’t help but stick out like a sore thumb and not necessarily in a good way. So you can understand my reluctance to buy one. But I resolved to have one and spent the last twelve months thinking about myself with one to the point where it seemed odd to me that I should be without it. Having found a holder I liked and of the right size I went for it. I now can’t imagine smoking without it. More to the point, because it feels natural I use it in a perfectly natural manner and in doing so I draw less attention to myself in the process. When I decided to start wearing bowties I went through much the same extended thought process and given that the purchase was not time sensitive it was time well spent. “A man cannot be comfortable without his own approval”. Why care what others think? Do as you please and be happy! I have the same reluctance over hats and cravats. Haven’t got over the hump yet. Braces, waistcoats, pocket squares and the regular use of ties didn’t cause me issues for some reason. I think in some ways I’d be more comfortable with hats or cravats if I either didn’t have the beard or didn’t need to wear glasses – feels like too much visual noise otherwise. 6. It’s a really well written and important article. I think a lot of men need to take to heart that we live in a world that expects relatively little from us. When we step outside of those expectations for style or for any reason really, there are going to be people that wonder why we did it? They’re also going to wonder about how your exceeding of expectations reflects on them. They don’t want you to look better than them. When it comes to what I want to wear I follow my heart but it’s not always easy. 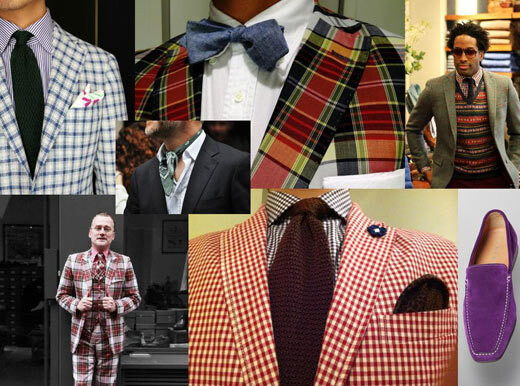 In the beginning I remember shying away from my bowties and patterns. But I forced myself to wear what I loved and eventually I didn’t second guess it anymore. Great article. Thanks.